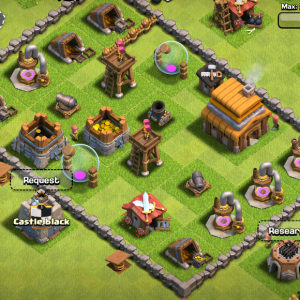 When you raid a town in Clash, you see the town’s layout and can choose where to release your troops. Once you release them, however, they choose where to move and attack… and your troops aren’t very clever. They always attack the closest target that fits their targeting criteria. Normal ground troops will attack anything, while specialty troops only attack certain structures like defenses. You can’t focus on a target the same way you can in most strategy games. Even if you send all your barbarians after one cannon emplacement, once that one is destroyed they scatter to two or three others, getting cut down before they can accomplish anything. If a dangerous defensive weapon is surrounded by walls and lesser defenses, your troops will never get to it in time. My first reaction to the game was frustration. Why can’t I give commands after sending in my troops? Why is it so hard to take out one simple mortar? Why are my troops so stupid? Constraints. By removing the assumed affordance of directing your troops, Clash forces you to see a battlefield differently. Because your troops follow only their own AI, you have to plan ahead and predict what they will do. Sometimes you’ll send a sacrificial troop ahead to trigger hidden traps. Sometimes you’ll distract defenses while you drill deep into their town. Sometimes it may be better to break through a wall under heavy fire than to take the long way around. This influences town design as well. In many base-building games, non-defensive building placement seems arbitrary, at least to a beginner. Clash makes it immediately clear that this isn’t true. Every building is a wall, a honeypot, a distraction. You have to think about the path that an attacker might take into your town. Do you have a weak point? You could seal it, or you could line it with traps to drop the attacker’s numbers below that which can challenge your defenses. The fact that every attack against you can be replayed helps with this base refinement process. You can see when your defenses fail, understand where you missed a vulnerability, and occasionally celebrate as you see an attacker become frustrated and give up. Your own town persists, but your targets don’t; you can only attack random players or get revenge on ones who have attacked you, once. The only targets you can attack repeatedly are goblin encampments, which serve as a single-player tutorial accompaniment to the multiplayer matches: more puzzles than actual fair fights. Clash of Clans could have let you control your troops. Even tapping a building to focus attacks would have been simple to implement. By choosing not to do so, the developers are abstracting the low-level tactics to highlight the higher-level strategy. You have to think of your troops as expendable, simple-minded tools; even if they survive an attack, you lose any you’ve deployed. All that matters is the town and its weaknesses. This post was commissioned by one of my patrons, who knows who she is and isn’t sorry she made me play Clash of Clans. To request posts of your own, become a supporter.